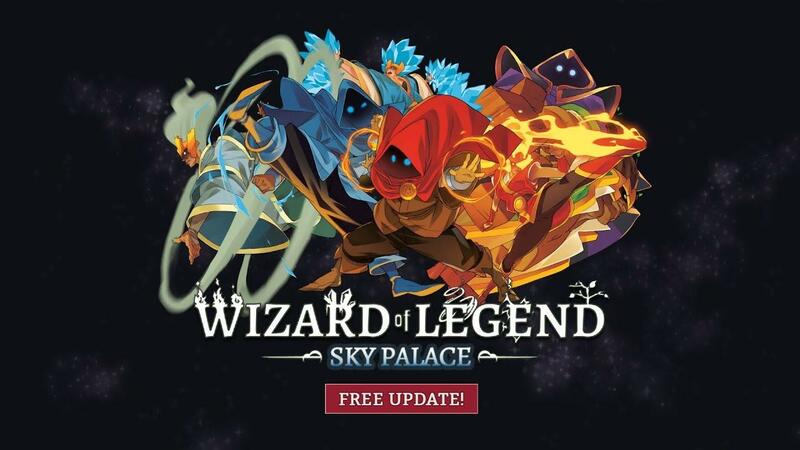 Wizard of Legend is one of my favourite indie games to play in local co-op and it's great fun alone too, the developer Contingent99 just released the huge Sky Palace update. The Sky Palace update has been teased for quite some time, first back in September of last year so we have been waiting a while on this. The wait was worth it though, as it includes more content than expected. It's quite a difficult game too, it honestly took me forever to get through one full run but I love the progression system. Even if you fail a run, you keep all the gems you collect to purchase new arcana and signatures (spells), as well as outfits which have different attributes and relics which give you helpful bonuses. Wind Sovereign Shuu, the boss you face at the end of the Sky Palace stage is a very interestingly designed character. Their attacks are crazy, throwing all sorts of wind spells around whilst they dodge with incredibly speed and pull you in with their magic too. A pretty big challenge to beat but damn fun! Another addition I'm particularly happy about, is when you're shopping a UI window will actually pop up when you go up to items to actually tell you what they do which makes me much happier with the progression when picking up new spells and items. You can grab it from Humble Store, GOG and Steam. I absolutely recommend it trying it out. This game has been on my Steam Wishlist since May of last year. I got a notice from Steam today that the game was on sale (40% Off) and now you mention the update. The only thing that prevented me from clicking "Add To Cart" in the past was the difficulty factor... But 40% off and the "progression system" convinced me to buy the game.